← Holiday USA – Stan Hodgson. Local sporting and classic car owners grasped the opportunity to give their vehicles an airing on this quite moderate weekend in the final month of winter. After some over-night rain, the early morning conditions were fine in Warragul, however, those travelling in from the Valley reported rain and fog hindering their journey west. Early arrivals had secured the prime positions at the southern end of the carpark well before 8am when your correspondent arrived in the Cooper S, but by pure chance my arrival coincided with that of new members Neville and Pauline Peters in their recently restored powder blue Mini Deluxe, so we parked the Bricks together. A few minutes later Andrew, Viv and Clint Wilson arrived in their Cooper S and Morris 1100, then Graeme Longhurst rolled up in his white and red Cooper S. Four Minis and an 1100, looked pretty good, but then Allan and Lorraine Richards arrived in their kelp beige Cooper S to make it five Minis in a row. 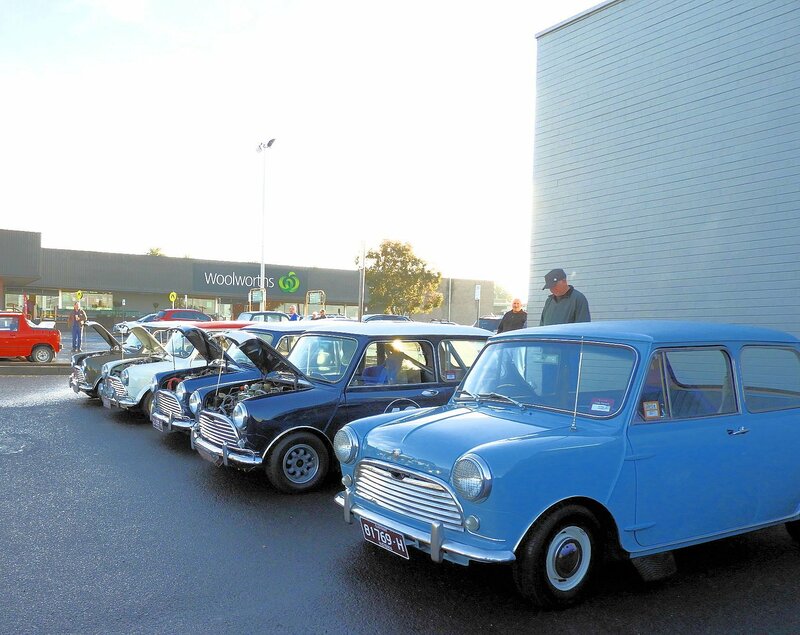 It was beginning to look like a Mini Club gathering, but a one-make club would find it hard to attract the usual large and eclectic range of British, European and Japanese sporting classics as well as American and home-grown iron that support our monthly Breakfast Club gatherings. A couple of interrupted counts resulted in an estimate of around 100 special vehicles in and around the Woolies’ car park this month. 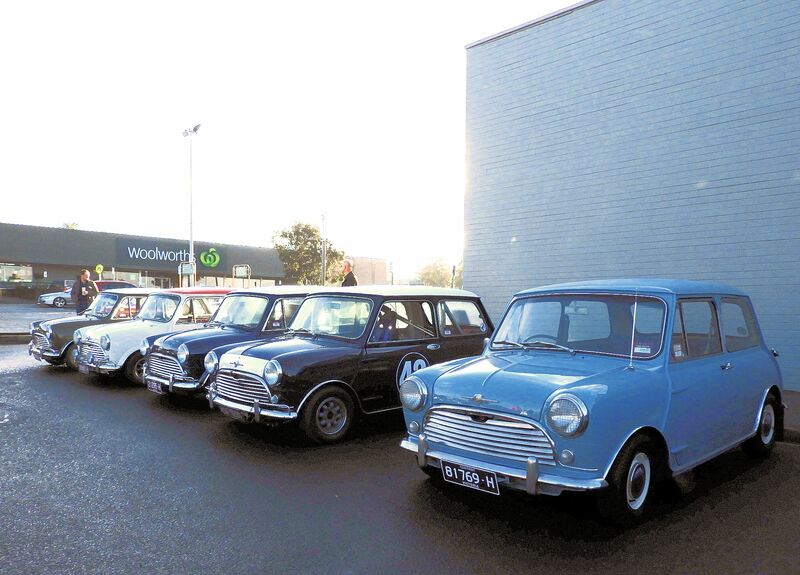 As well as the Peters’ Mini Deluxe, there were several others making their debut appearance. Steve Trapnell seems to enjoy regularly turning-over his cars and he often arrives with a new acquisition. This month it was a very tidy VC HDT Commodore complete with multi-coloured stripes. Paul Montagnat surprised us with a pink ’63 Thunderbird that he picked up only three days prior and Mort Fitzgerald brought his road-going MGB along for the first time. There was also a very original Humber Super Snipe, a tidy Triumph 2.5 sedan, a ’58 Ford Customline and even a burnt orange VW Combi camper. Locky Fowler raided his workshop and brought along a customer’s Datsun 240Z. It was interesting to compare the Z to the beautiful early E-Type coupe parked nearby, obvious similarities point to the designer’s inspiration. Cars were coming and going all morning, some not staying very long but making an impression none-the-less. A nice Porsche Cayman was seen at one stage, but gone before a proper photo opportunity presented itself. People were happy to hang around and chat for a while, enjoying the welcome sunshine before heading off to tend to their weekend’s domestic duties. If you missed out on this month’s gathering, make a note in your diary for the second Sunday in September.